The Inframat Pro is a gemstone heat therapy mat that is designed to facilitate better wellness of the body. This BioMat uses gemstones to channel deep penetrating heat 4-6 inches deep into muscles and tissues. 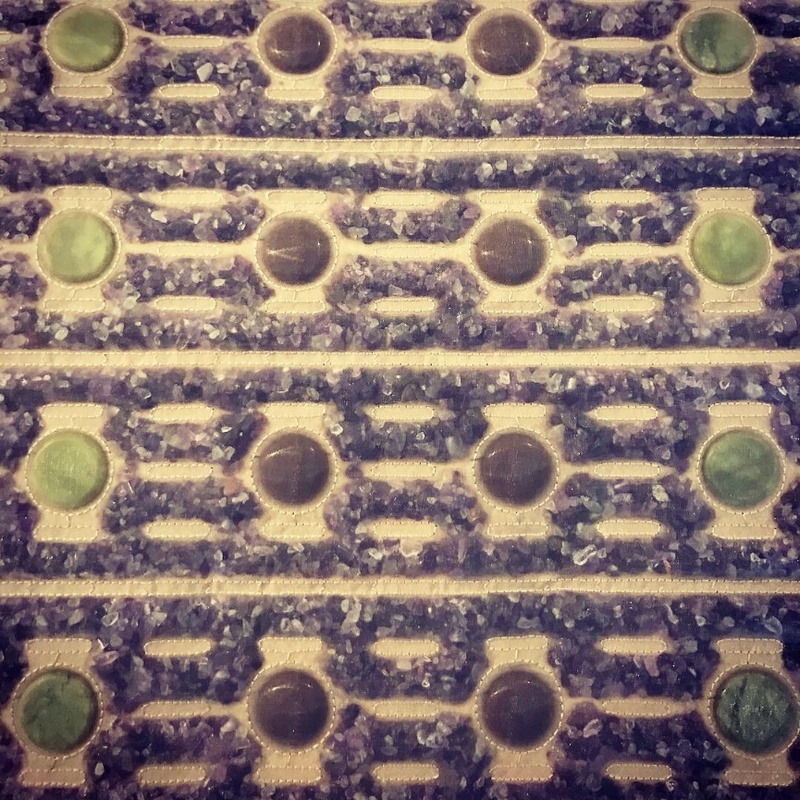 Our professional BioMat contains Amethyst, Tourmaline and Jade stones. The Healthy Line BioMat combines several therapies into one wellness-defining experience. These therapies include Hot Stone Therapy, Far Infrared (FIR) Therapy, Negative Ion Therapy and PEMF Therapy. The use of heated gemstones greatly amplifies the energetic benefits of the mat, the greater variety of gemstones increases this process. FIR rays are naturally absorbed into our bodies from the sun. When using the Inframat Pro, you are exposed to these rays of invisible light which can increase oxygen movement while decreasing pain and inflammation. Negative ions attract harmful positive ions which can help reduce the number of toxins and harmful metals from your body. Finally, PEMF therapy is the application of magnetic fields of a particular frequency to the body (7.83Hz). These specific waves are most in line with the Earth's natural magnetic field mimicking its frequency and intensity. What can it naturally manage within the body? Chronic pain, fatigue, detoxification, relax sore muscles, improve blood circulation, revitalize energy levels, decrease inflammation, improve the immune system, balance pH and many more! Pregnancy, varicose veins, open wounds, bypass surgery, pacemakers, muscle relaxers, blood thinners, decreased skin integrity, and temperature sensitivity. Should you have any questions or concerns, please consult your medical professional prior to this service. The information shared here is provided by the manufacturer. The Amethyst BioMat is not a substitute for appropriate medical treatment. Pre-treatment and post-treatment beverages to improve metabolic functions and toxin removal, a private, calming environment with soothing music, and a variety of essential oils to choose from to enhance your relaxing experience. 45 minute session for $35 or add this service to any massage or facial for a complete comprehensive experience. Packages of 3 are available for $100 and include an amethyst gemstone. Many famous civilizations have practiced the healing treatment of ear candling including the Aztecs, Greeks, Romans and Aborigines. The most noteworthy people in America to practice this treatment were the Hopi Indians of the Grand Canyon region in Arizona. The term "candle" can be misleading as they are hollow, wick-less tubes made from cotton, flax or hemp fibers infused with beeswax. Ear candling may be used to alleviate symptoms of colds, earaches, excessive ear wax, allergies, headaches, migraines and many others! A hollow tube is gently inserted into the ear canal. When lit at the top, the rising air column inside the candle begins to heat up creating a gentle massage and suction effect. This process loosens compacted earwax and debris. Our treatment also includes lymphatic massage of the area and the application of Willow bark oil. Perforated ear drum, artificial ear drum, ear tubes, eczema or dermatitis of the outer ear, cochlear implant, current or recent infection, under the influence of drugs or alcohol, acute infectious diseases, fever, diarrhea or vomiting, recent head or neck injury, skin infections and pregnancy. Please consult your medical professional with any questions or concerns prior to receiving this service. $25. Please allow 10-15 minutes per ear, one candle per ear is applied during this 30 minute treatment. The ionic foot machine works by charging sea salt water through electrolysis to attractive positive and negative ions. This type of detoxification dates back to Indian Ayurvedic medicine and in Roman times as a way to draw impurities away from the body. Toxins are charged particles that circulate through the blood in the foot region. The human feet contain 250,00 sweat glands and 200,000 nerve endings. These toxins are attracted to the opposite charged ions and are drawn out into the water by osmosis and diffusion. The benefits of the foot detox cleanse can include the purging of heavy metals, balance of the body's pH, reduction of pain and inflammation, detoxification of internal organs, boosting the immune system and many more. It is noted that the the water will change color regardless if the person's feet are in it or not due to water impurities, however there will be 2-3 times more debris in the water when the foot treatment is complete. Please consult your medical professional should you have any questions or concerns prior to receiving this service. Pacemaker or other electronic implements, hypertension, organ transplant, pregnancy or nursing, epilepsy, open foot wounds, are undergoing radiation or chemotherapy, and blood regulating medications. A quiet and private room where you will be seated during the 30 minute treatment. A variety of books, calming music and detox teas are also offered to make your foot detox session as relaxing as possible. Packages of 3 also available for $90. 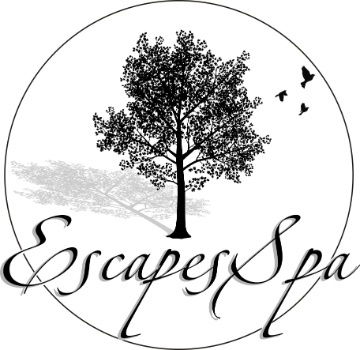 For those seeking further detox services, Escapes Spa also offers Lymphatic Drainage Massage, Body Salt Scrubs & Dry Brushing. These treatments can be found in descriptive detail under our "Massage" tab.